We'll use the other half of the Red Pepper Sauce on Saturday. 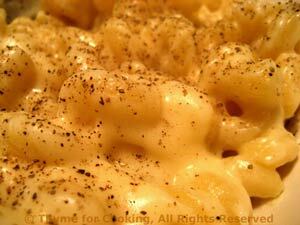 Since the salad is a large serving of vegetables, I didn't do another for a side dish - and the Mac and Cheese is rather filling. Add some sautéed spinach is you like. I originally made this salad with frozen Lima Beans, which are not available here. Now I use flageolet, which may not be available where you live. Use lima beans, white kidney beans (cannellini), smaller, navy beans or even edamame.... All drained, rinsed and drained again. Cook beans if using frozen. Drain and rinse if using canned. Slice celery 1/4 inch thick (.65cm). If very wide cut rib in half length-wise first. 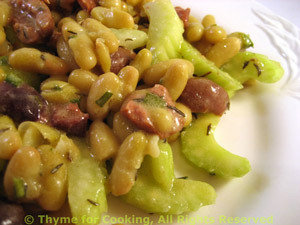 Put beans, celery, olives into a bowl, add vinaigrette, stir well to combine. Whisk vinegar, mustard, and herbs. Slowly whisk in oil until thick. The slightly spicy red pepper sauce is a nice contrast to the sweet salmon. Save remaining Red Pepper Sauce for another use. Roughly chop pepper, onion and garlic. Sauté pepper, onion, garlic and chili powder until vegetables are soft. Add chicken stock, vinegar, cover and simmer 5 minutes. Purée in blender with as little of the stock as possible. Pour sauce out of blender into a small bowl and stir in yogurt. Put salmon on lightly oiled baking sheet. 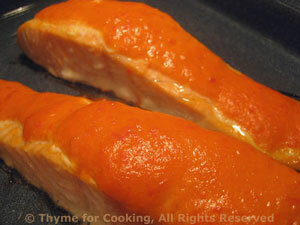 Spoon some of the Red Pepper Sauce evenly over each salmon fillet. You should use about 1/3 of the sauce. Bake at 400 F for 15 - 17 minutes, until fish flakes easily. Serve. Note: For easy clean up cover pan with foil first. This is especially nice if you are using fillets with the skin on. You can carefully lift the salmon off the skin to serve, leaving the skin on the foil. Then wrap the whole mess up and toss. In a medium saucepan heat the butter over low heat. Add flour and stir with a whisk for 1 minute. Add a little (1/4 cup) of the milk and whisk to combine. Turn heat up to medium and keep adding milk, a little at a time and whisking. You should have added all of the milk in a minute or 2. When all of the milk is in, bring to a boil (should almost be there), whisking. Remove from heat and stir in cheese. If the cheese cools down the Béchamel too much to melt, put it back over low heat, stirring until cheese has melted. Do not boil or the cheese may seize - separate into a stringy ball and floating oil. When pasta is done, drain and put into a large bowl. Pour Béchamel over and stir until well combined.